An exceptionally spacious and tastefully refurbished detached house boasting an amazing full-length reception/kitchen, large landscaped garden and six well proportioned bright bedrooms. Occupying a quiet residential location close to the amenities on the A1000/High Road. Delightful Friary Park is within easy reach, while commuters will benefit from nearby bus links and Woodside Park Underground station. A lovely café on the High Road. Great for lunch, nice selection of sandwiches, mini pastries and pasta dishes and they have their own juice bar, where you can design your own juices/smoothies! 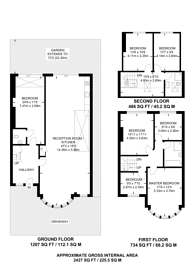 2,427 (225 Sq M) approx. We have over 1,000 property market reports for locations across London and Surrey - including N12 and North Finchley.